Rock On slot, or should we say Rock On!, is an edgy 5 reel video slot, part of Rival famous i-Slots series. What you should specifically notice about this machine, is that it’s one of the loosest slots online, with expected payout of 98%. As we said, this is one of the best paying slots online. It takes only few spins to notice that the wins are very frequent and can be quite generous. Obviously during the bonus features the payouts are much higher, but even during the regular play Rock On pays quite well. For me, the highest wins came during the Rock on bonus. Somehow during the free spins I wasn’t very lucky. 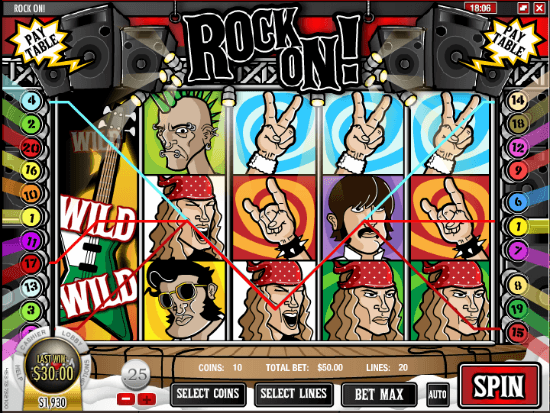 Rock On is a 5 reel, 20 payline slot machine. As we said, it’s part of Rival’s i-Slot series. I have to say that I have no idea how Rival decide which slots are i-Slots and which are “regular”. Rock On! indeed offers great animations, sound effects and nice Guitar Hero style bonus, but it’s very different from the famous i-Slots: Reel Crime and Cosmic Quest slots. Compared to those two, Rock On is a relatively simple game and in my opinion, should’ve been placed in the regular video slots section. Every aspect of this game revolves around Rock: various Rock figures, symbols and cool sound effects. Green guitar is the wild symbol. It can appear on reels 1,2 and 3, and substitutes for all symbols except the scatters. It is an expending wild and can cover the whole reel creating multiple winning combinations. Rock On! 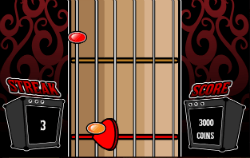 has 2 scatter symbols: Drum Set – which triggers the Free spin feature; Elvis – triggers the Rock On bonus round. Scatter wins are added to regular wins. If you get 3 or more Drum set’s anywhere on the reels you will activate the free spins. In any case you will get 5 free spins, however the multiplier varies according to the number of scatters. For 3 scatters all free spins winnings will be tripled. 4 scatters – x5. Five scatters and you will get 5 free spins with x10 multiplier. This is a Guitar Hero style skill bonus. If you have been playing Guitar Hero – you should do really well, but even if you haven’t, it’s quite easy to master. During the bonus you will need to play a guitar according the notes coming at you. After 1-2 times, I figured how it works and it paid very well. To trigger the Bonus rounds you will need to land 3 or more Elvis symbols on the reels. Personally, I like this slot. It’s quite simple, with outstanding sound effects and generous payouts. That’s more than enough for me. Check out the Guitar Hero bonus round. You can play this slot for real money in one of our top Rival Casino sites. Here you can find Free online slot machines.